Studio-made: featherweight pendant of woolly mammoth bone bead, carved bone bead nestled in recyced sari silk black ‘folliage nest’. Africa: batik, carved bone tube. Other materials: 1 woolly mammoth bone beads 10,000-100,000 years old. Stainless-steel spacers; Silver-plated brass spacers. 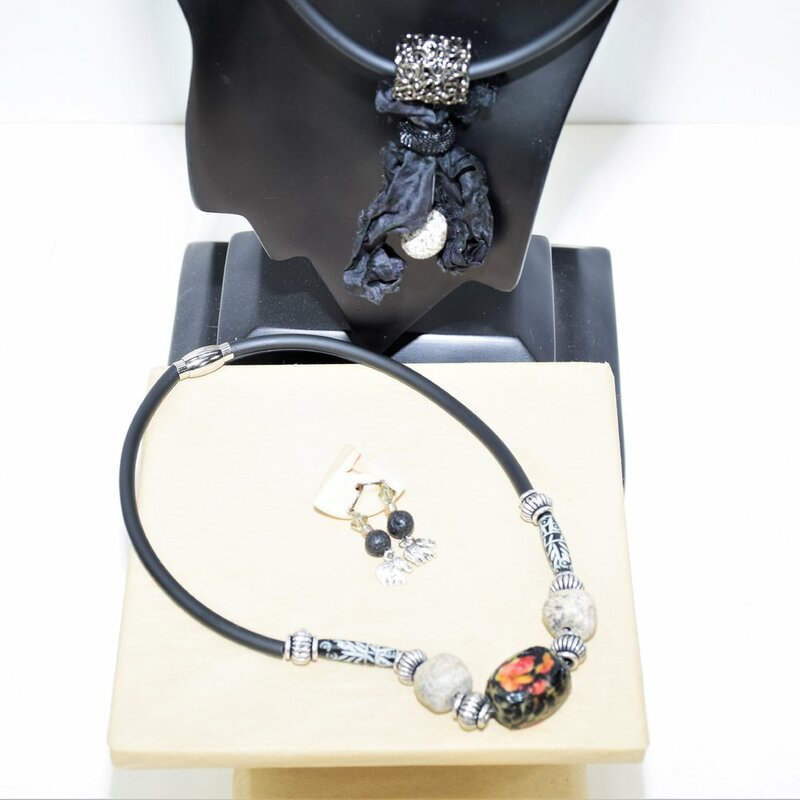 Rubber tubing, lava balls for earrings, silver-plated brass elephant charms. Antique silver tone brass, twisted, hollow drum shape bead. Aluminum mesh disc. Black wire. Handcrafted in America; natural variations and minor substitutions for sizing apply. Necklace shipped in burlap bag w/recycled tissue. The story of this specific NS281 Modern Origins Woolly Mammoth Silk+Bone Pendant w/Earrings developed in early March 2019 is quite special. Frequently waking up in the middle of the night, connecting dots around human origins and the many examples of coincidences that have dominated my life always, I’m accustomed to surprises and even interventions. The goddesses seemed to be speaking to me last weekend, when an image on National Geographic or the Smithsonian caught my eye, taking me on an unexpected digital journey to Ethiopia’s Omo Valley, a key source of GlamTribal’s inspiration.